MASW Seismic Surveys Map “Stiffness” of soils in a cross- section. Mapping lateral variations in soils using electrical methods assists with characterizing the local geology. in soil conductivities at a levee. A Geonics EM-31 electromagnetic terrain conductivity meter is often a great way to map lateral variations in soil conductivities at a levee. GPR can image sand and gravel units to help map possible preferential paths for water to flow through a levee. MASW Seismic data is often acquired with 4.5 Hz geophones attached to a land streamer. An EWG Seismic energy source is often needed to create the necessary seismic waves for refraction, reflection, and MASW surveys. how soils vary with depth. Earth resistivity Survey using a multi-electrode SuperSting system can yield a cross-section of how soils vary with depth. A levee can come in many shapes and sizes. 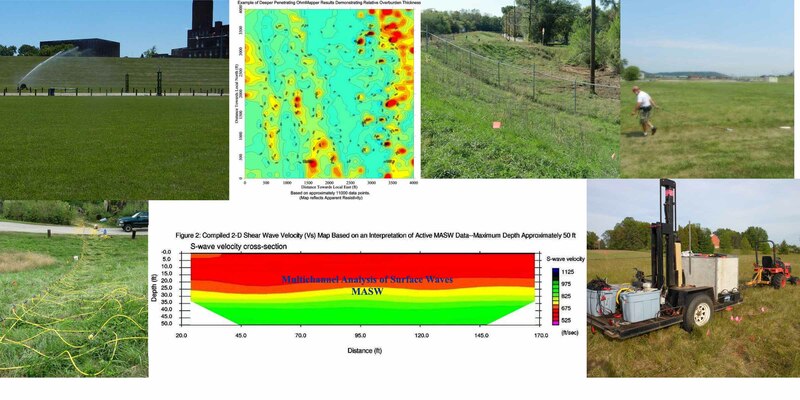 OhmMapper capacitance coupled earth resistivity maps variations in soils across a levee. Geophysical methods are often used to investigate a levee. is available. Click here to go to a geophysicist or here to rent geophysical equipment. Engineering geophysical methods can assist in the certification of a levee. A levee design often incorporates geophysics when building a levee. Levees control the flow of water and assist with limiting flooding. A well designed and maintained levee will have a life expectancy much greater than the people who constructed the levee. A poor levee design or unmaintained levee can lead to levee breaks and levee failure. The effects of large storms like hurricane Katrina and hurricane Sandy can exceed the engineered design of a levee. Since the construction of a levee may include soils, rock, concrete, and other man made materials it is important to review the condition and effectiveness of the these materials throughout the life of a levee. Freeze-thaw, storms, and the flow of water are destructive forces that can erode and eventually compromise the integrity of a levee. The US Army Corps of Engineers Levee Safety Program provides information about levees in the U.S. The program states that “The approximate 2,000 levee systems, comprising roughly 14,000 miles of levees currently in the USACE Levee Safety Program may only represent a small fraction of the estimated 100,000 miles of the nation’s levees.” Over time, living behind a levee that is not up to current standards can lead to a false sense of security. Local levee owners or sponsors are responsible for obtaining levee certification and accreditation. These documents are utilized by the National Flood Insurance Program NFIP to assist with providing flood insurance. The US Army Corps of Engineers’ USACE methods and information may be used by the NIFP. The USACE Manual No. 1110-2-1913 30 April 2000 DESIGN AND CONSTRUCTION OF LEVEES provides a wealth of basic principals for levee design and levee construction. It points out that levees can be “dictated primarily by flood protection requirements, which often results in construction on poor foundations,” and the soils used to construct the levee or “borrow is generally obtained from shallow pits or from channels excavated adjacent to the levee, which produce fill material that is often heterogeneous and far from ideal.” These less than ideal conditions can lead to underseepage, through seepage, slope instability, settlement, and poor trafficability of the levee surface. For help today, fill out aLevee.Com’s form. Skip over the form and go to the bottom of this page to leave a comment. Are you interested in geophysically surveying a levee? Who owns or is responsible for the levee? Are you familiar with geophysical methods, if so, which ones? For these questions to be submitted to someone, you will need to provide some way for us to contact you on the next page. Geophysics plays an important role in characterizing a levee’s geology.